My first and only full day in Antigua was a full day indeed. And it was also a day that I will not forget. One of those truly memorable days while traveling that makes traveling so delightful and so addicting. The day included a non-stop fast speed tour of Antigua’s main sites with my blogging friend and local Antigua resident Lucy, and well over 400 pictures each. In fact, so much transpired during that one day in time that I need to break down my posts on Antigua into different topics. 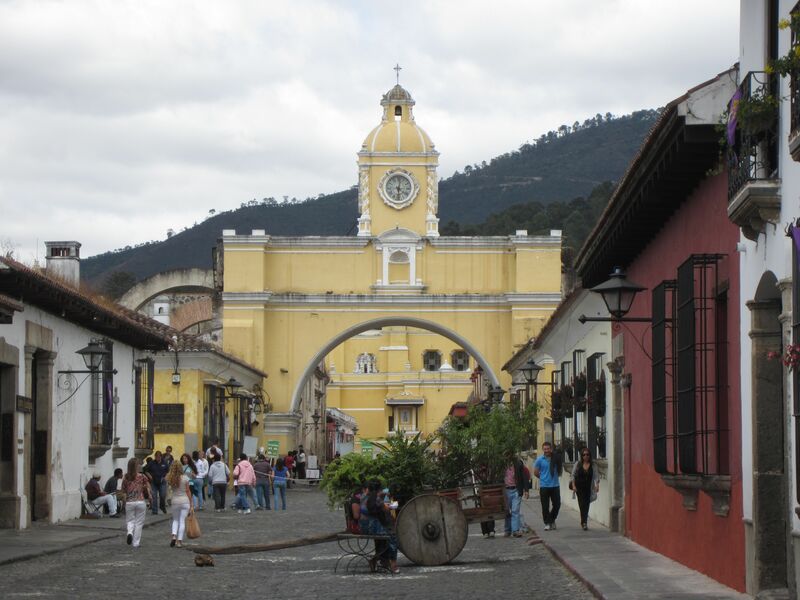 The first and easiest one to pursue is my eventful morning in lovely, picturesque Antigua. The well known landmark and arch, Arco de Santa Catalina was awaiting my arrival. After an exhausting travel day and week before, when my tired soul finally hit the bed, albeit an extremely comfortable one (no barking dog outside my window or person banging around in the kitchen at one am! ), I slept like a rock. I woke up, a little past seven, feeling well rested for once. 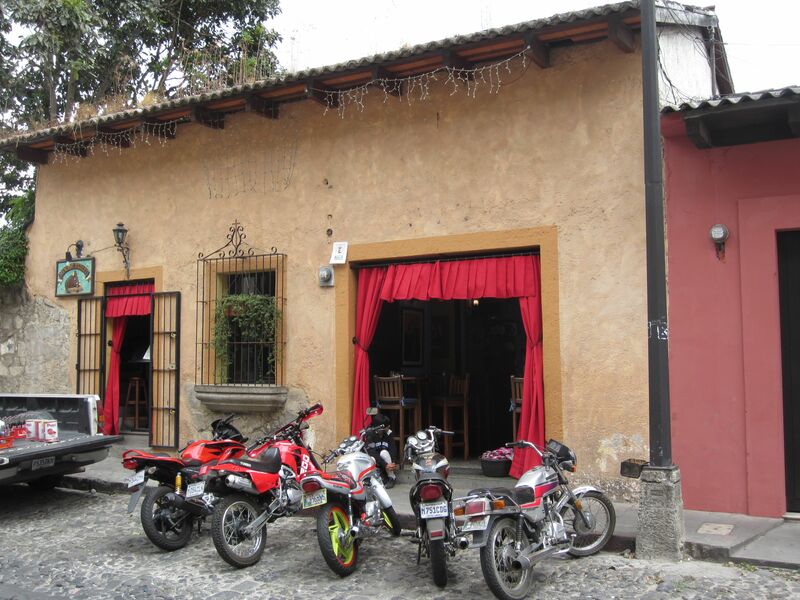 I took my first hot shower in over a week (a luxury in Guatemala and a norm in the spoiled Western world), checked emails and then had breakfast made to order for one at my lovely B&B, Hotel Tradiciones Antigua (see past post). Around nine o’clock the door bell rang, and lovely Lucy had arrived. Lucy was all smiles as she walked in the door to greet me. Although she was feeling under the weather, you never would have known and she wasn’t going to let that stand in her way from being the best, most knowledgable tour guide possible of her current hometown and beloved Antigua. She had our day all planned out, what things to see, where to go and what to do. I had to do nothing but show up! Our goal: To see as much as humanly possible in eight hours until we would drop for a huge pig-out meal. I could hardly wait to get started but unfortunately one annoying piece of business had to be accomplished before our fun could start. I needed some cash and we had to go to the bank. You may think this sounds strange. Wouldn’t I just go to an ATM, withdraw money in a heartbeat and be done with it? Isn’t that what a person always does? Not in Antigua, apparently. Lucy had warned me about the new kinds of advanced thieves that put pin readers inside the ATMs. I had also read about it in Lonely Planet as well as on the US Government Travel Advisory website. 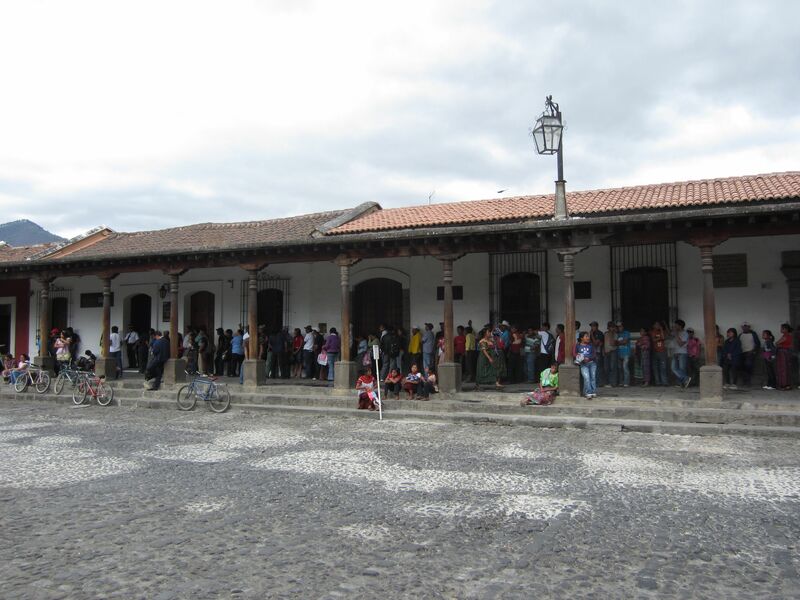 I had gone an entire week using ATMs daily in Xela, withdrawing money here and there and as far as I knew it there had been no problems. Yet apparently the problem is much greater in Antigua where loads of wealthy travelers visit each year brining along their pocketbooks and credit cards with bank accounts just waiting to be wiped out. In a nutshell, I decided that it wasn’t worth taking a chance and risking it. Instead of using an ATM, Lucy would bring me directly to a trusted bank and I would manually withdraw money which would require two lines and lots of wasted time. But better safe than sorry. 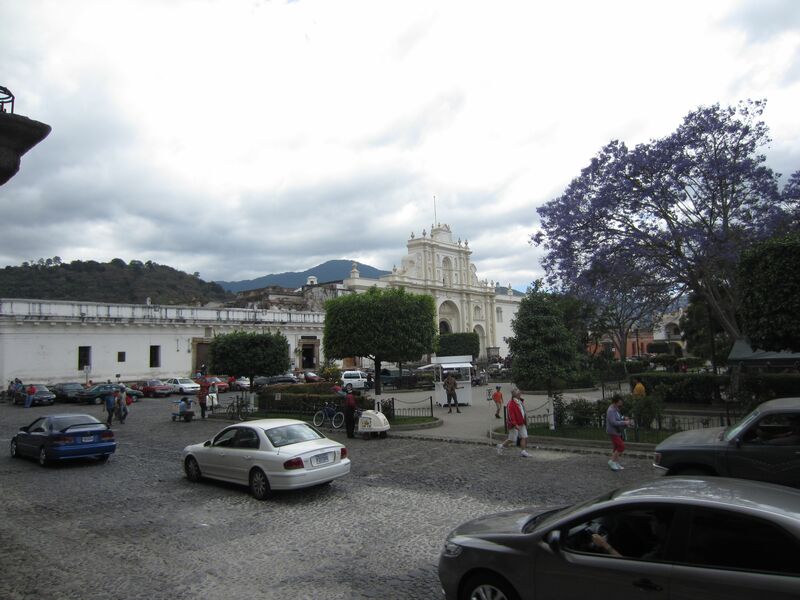 Lucy and I set out to accomplish our mandatory piece of business which involved my first trip to a Guatemalan bank. I was excited about the day (not the bank part) but a little disappointed because the weather wasn’t clear. It was good for taking pictures yet the low lying clouds blocked the famous view of the three volcanoes that surround the city and are the centerpiece of Antigua. Lucy told me it had been idyllic, crystal clear weather the last few days. Hopefully the clouds would lift before I left the next morning. 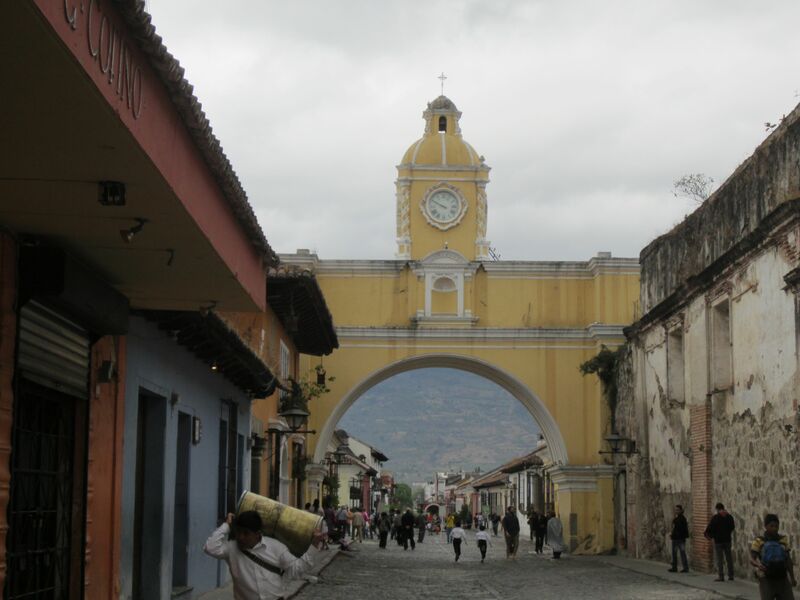 First site of Arco de Santa Catalina, the landmark of Antigua which was built in 1693….I’m trying to picture the enormous, pointed volcano that jets up to the sky behind the thick clouds. Maybe later? 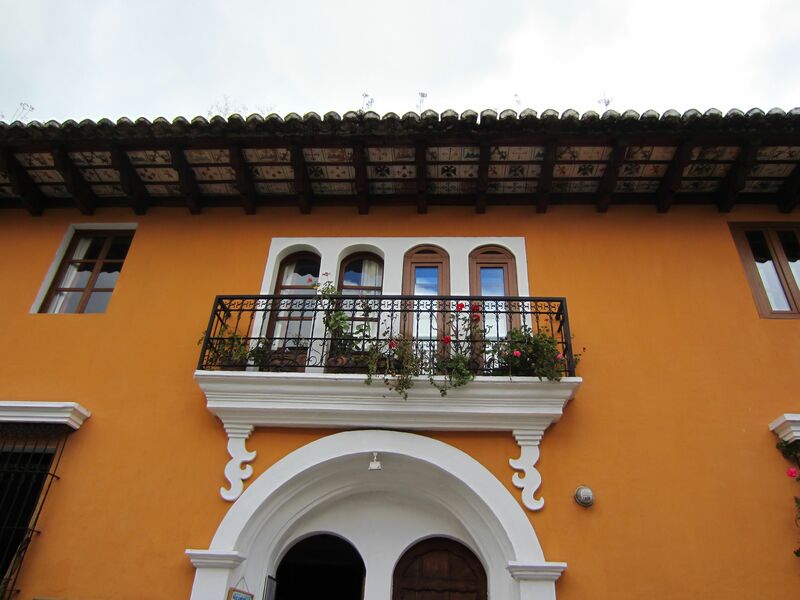 Walking down Calle del Arco you can see the traditional charm and Spanish colonial style that is reflected throughout Antigua. I adored the gorgeous, bright colors of the buildings. Even on a cloudy day, the colors were brilliant enough to brighten your spirits. 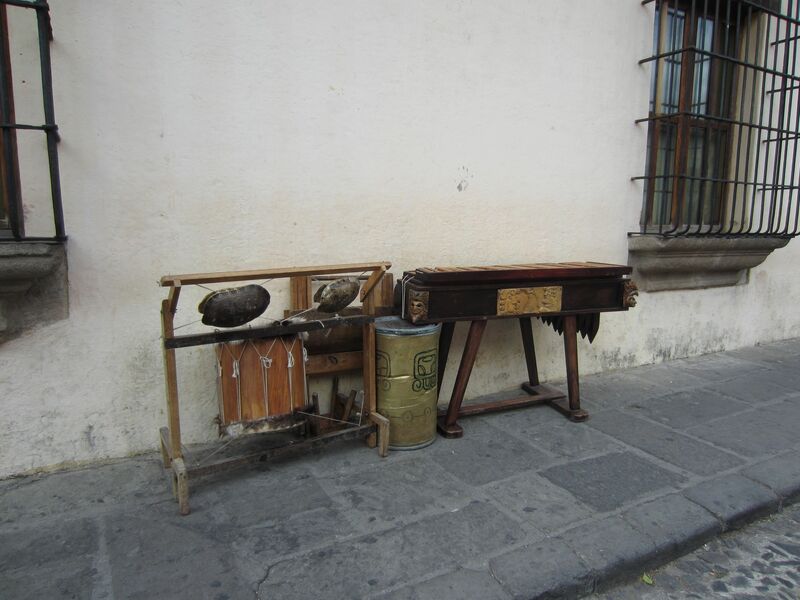 The marimba is special to Guatemala. Apparently there is live marimba music here yet I never had a chance to hear it. Next time…. Unfortunately there are always people in need, like anywhere in the world. I found this cart interesting. I’m not sure what it was being used for and why it was just sitting there. Hmmm? More colorful buildings. So gorgeous! I also loved the chipped, layered paints. You could imagine the building over the years in all the colors left behind. Flower beds are everywhere too. So beautiful! 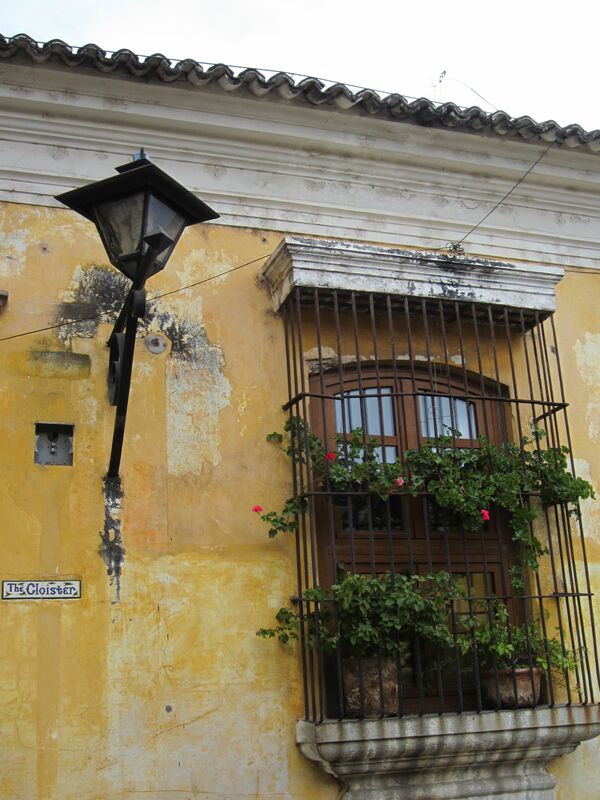 Antigua is known for its bars, cafes and restaurants. You can find anything you desire but I liked the local food best. 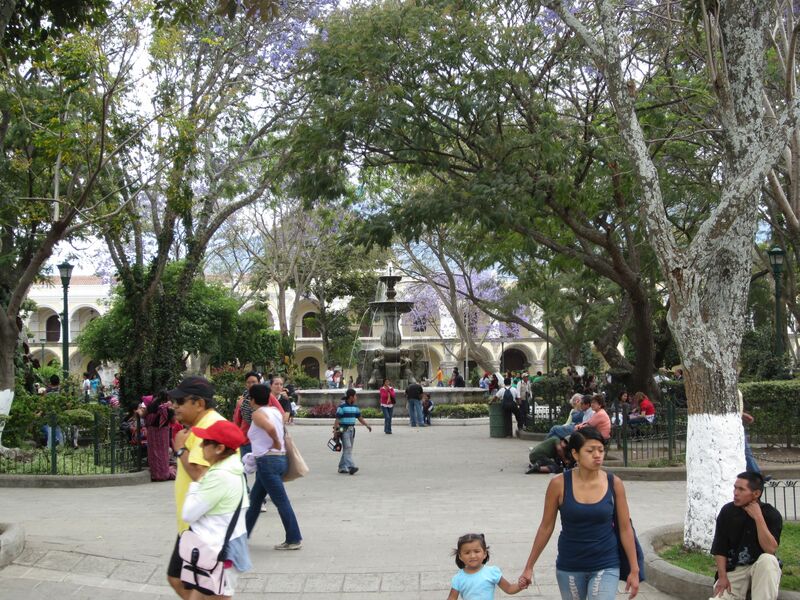 The lovely parque central which centers the city and is surrounded by restaurants and cafes….and banks. It is the place to be. 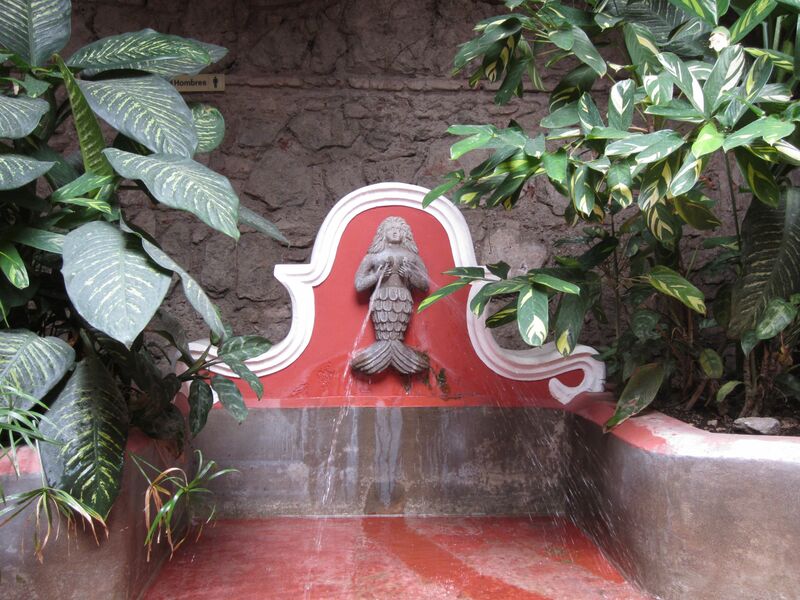 And the park’s centerpiece, Fuente de las Sirenas (The Mermaid’s Fountain) which was built in 1738. 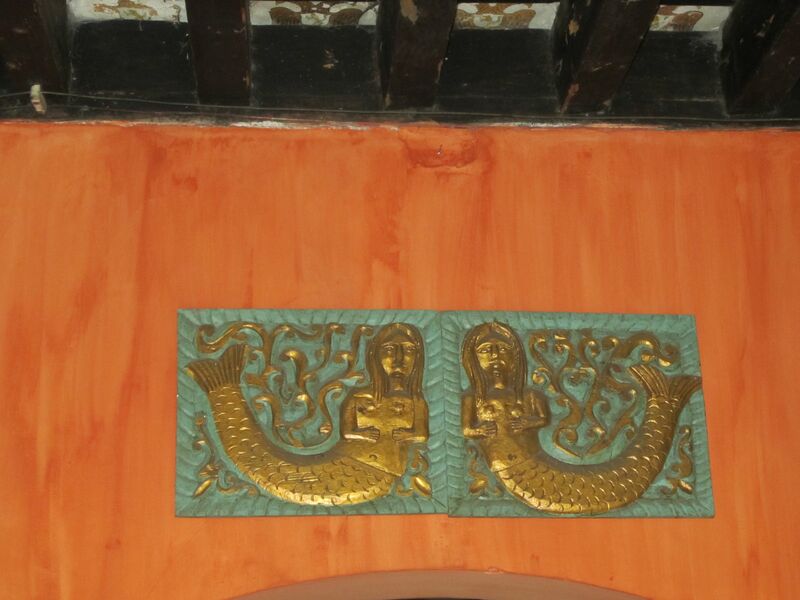 Interesting mermaids with water sprouting out of their breasts. Hmmm…. Couldn’t resist a close up shot. 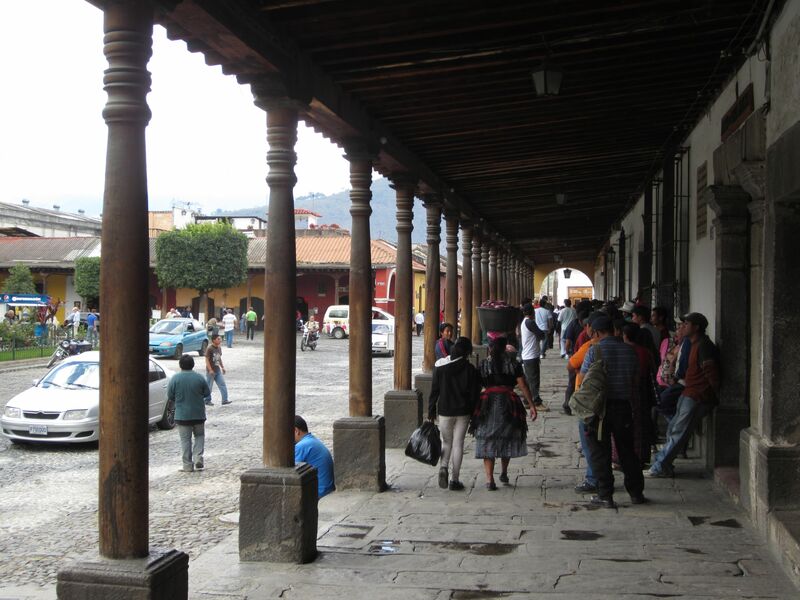 In the back is a view of the Catedral de Santiago which I will visit in detail later on in the day and on a future post. This is also where the frustrated shuttle bus driver finally dropped me off at the taxi stand after 45 minutes of driving around Antigua searching for my hotel (which is only five blocks away!). 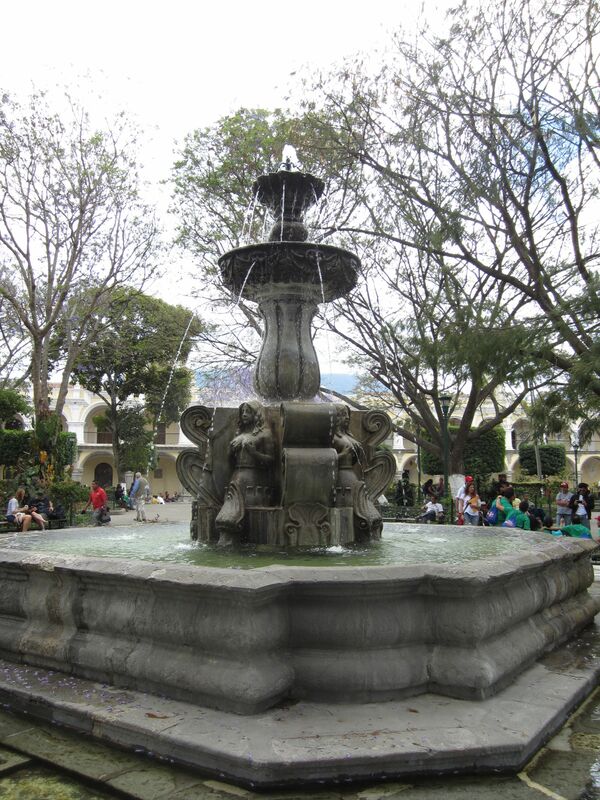 From the parque central, we saw the line. Yikes! 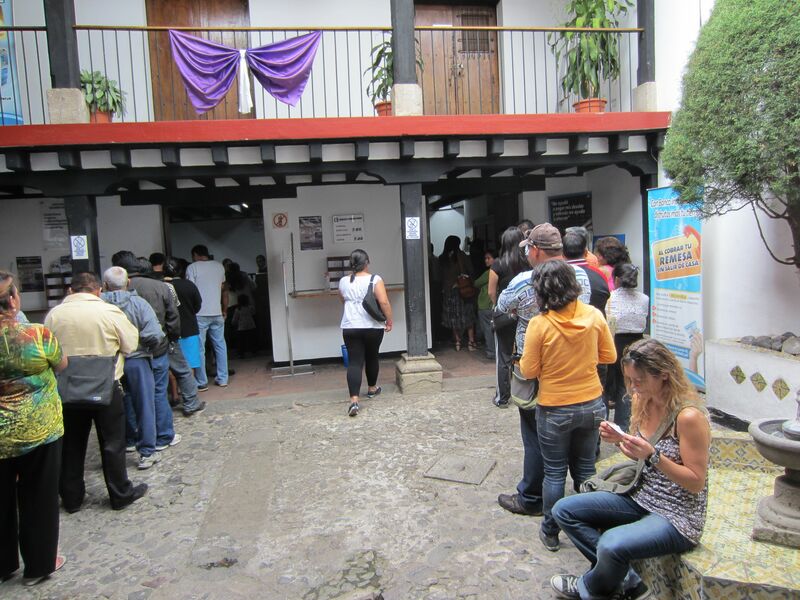 This was going to be an annoying experience….my first and last visit to a Guatemalan Bank. Lucy told me that the line can take hours on the weekends and twice a month on paydays. It is the only safe and secure way to deposit and get money. Here was our first line (Lucy is sitting on fountain on right side as I pretend to take her photo so I can capture the bank line without getting busted by security. A fun trick Lucy taught me!). This line was just to make the initial request and took at least an hour. At least we had tons to talk about! But still…Antigua sightseeing was awaiting and time was being wasted. Our next stop in the bank was to go upstairs where we personally met with a bank employee with my deposit slip to collect the cash. 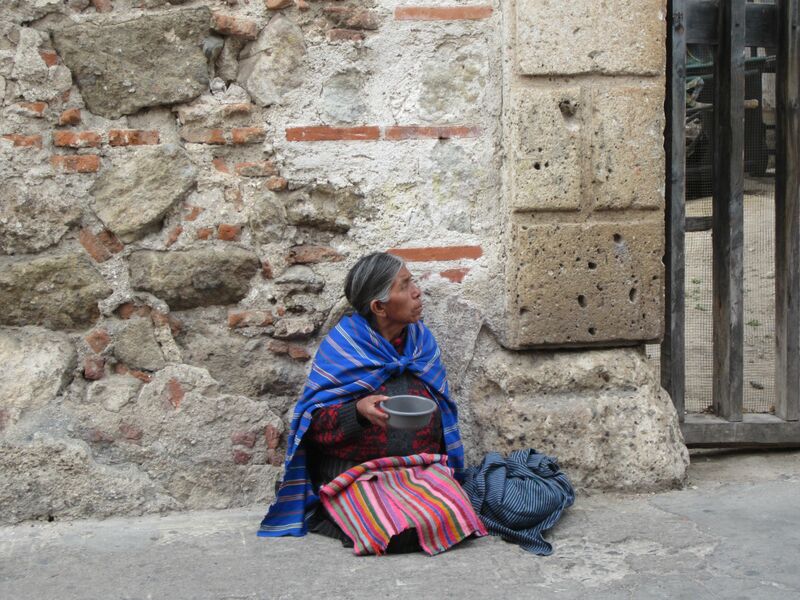 Although it wasn’t a lot of money per Western standards, in Guatemala a couple hundred bucks is a months salary. Thus we had to be careful with the money and head straight back to my hotel to put it safely away in a safe. All in all, my trip to the Guatemalan bank costed us almost two hours! So, what did we do next as a reward? 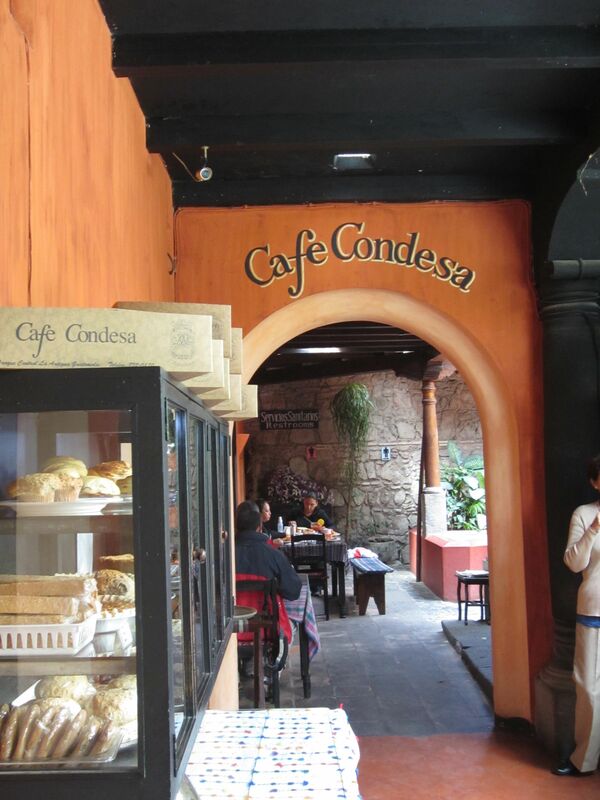 Went to Lucy’s favorite Guatemalan Cafe, the gorgeous Cafe Condesa for a coffee and treat! We needed some kind of pick me up (mi gasolina, remember) after the annoying experience at the bank. (I hate lines). 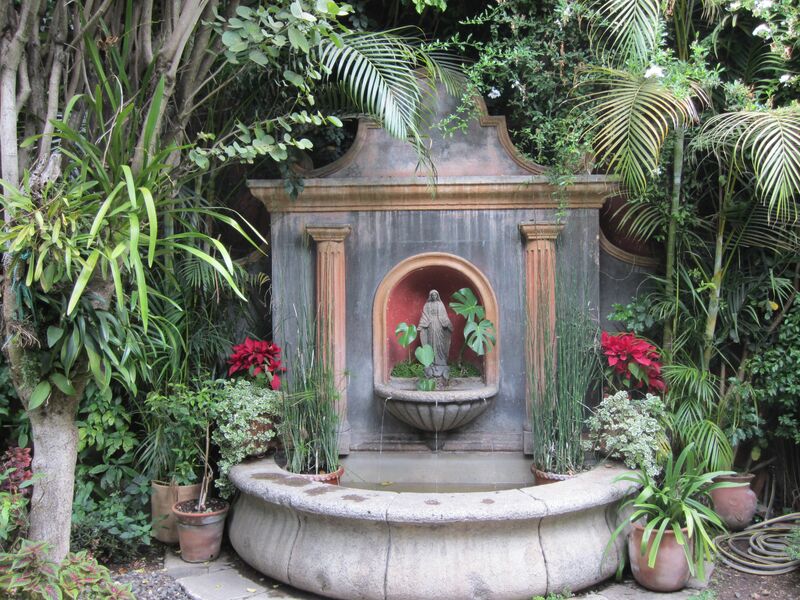 The cafe is stunning with lots of fountains, flowers and delicious treats. 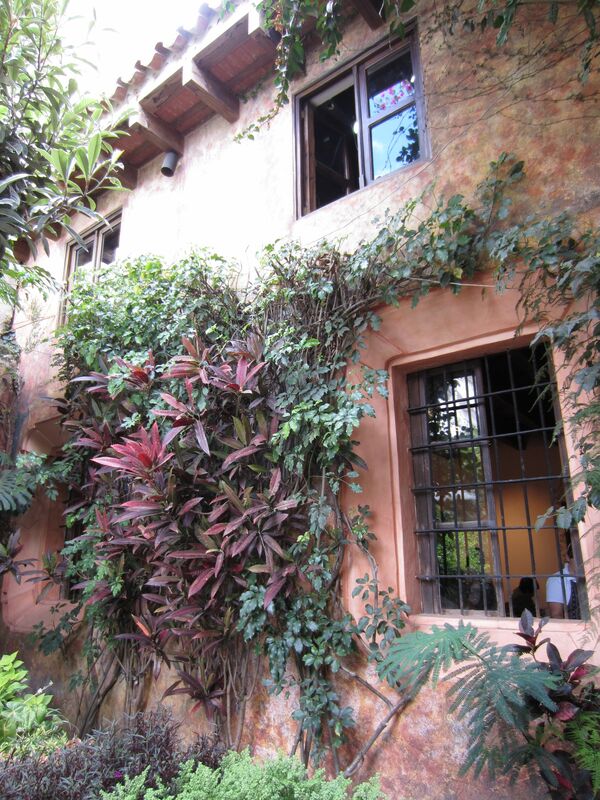 Here are some of my favorite photos of Cafe Condesa. It sure is no Starbucks!!!! (Thank God). The outdoor courtyard was the best place to sit and have coffee. 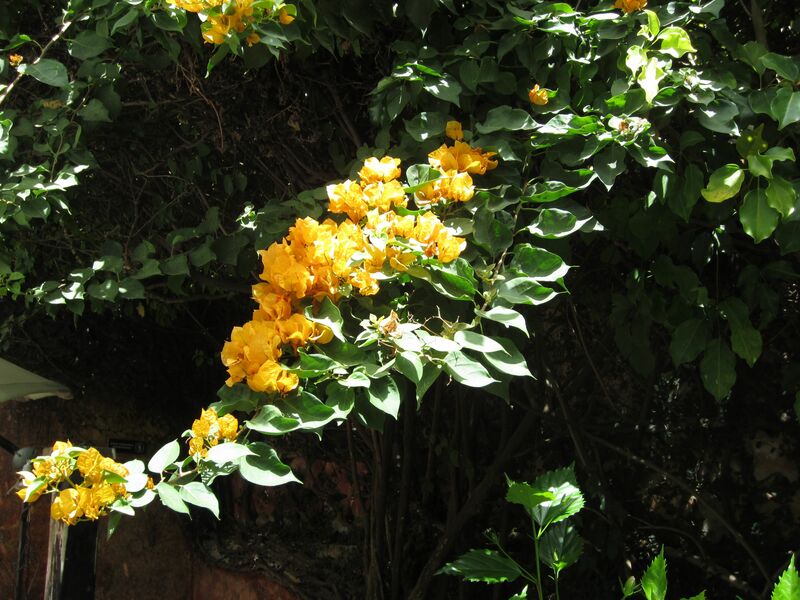 Delightful flowers and birds singing. What could be better and more relaxing? 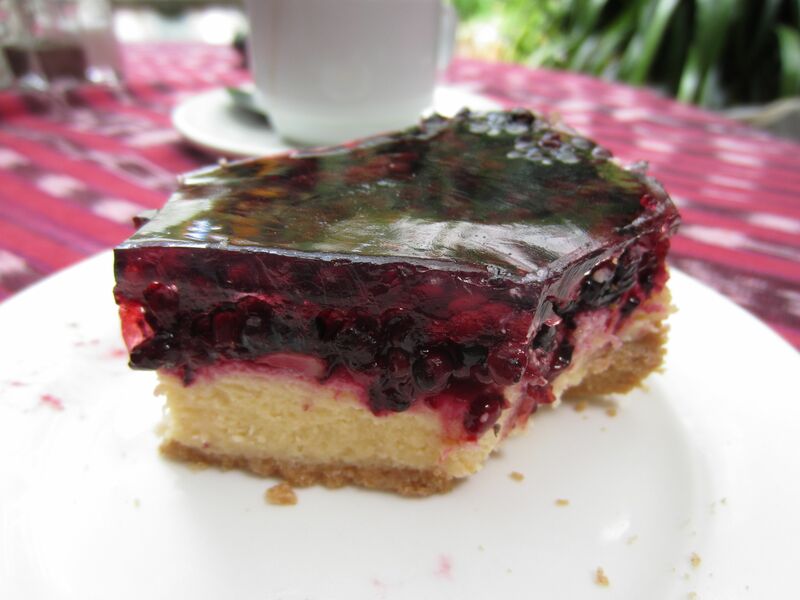 Our reward….a lovely berry cheesecake! It was as delicious as it looks. 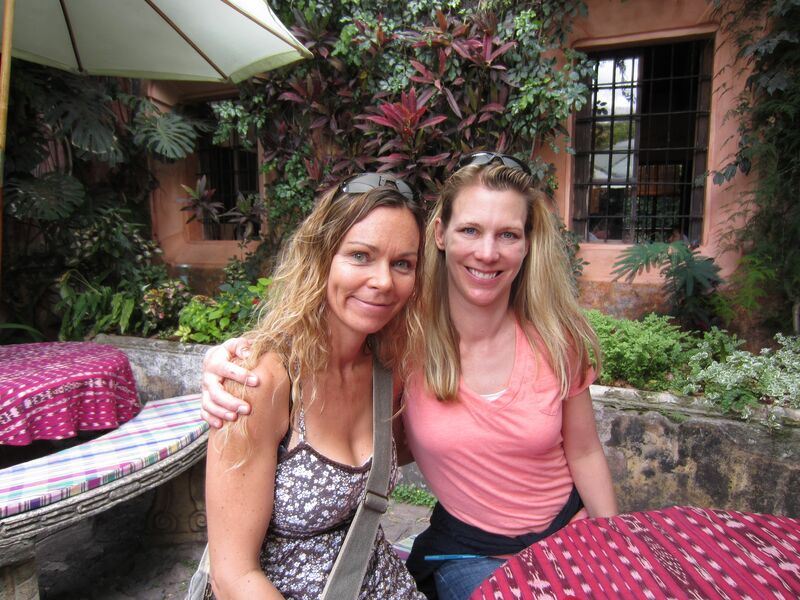 Lucy and I, ready to seize the day and seize Antigua! Ready, set go! 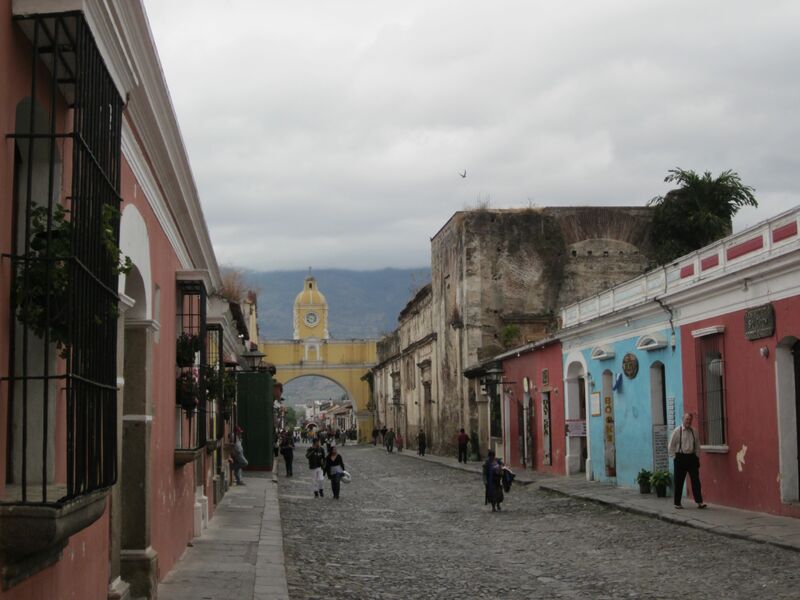 Stay tuned…next post will be the first ruins we saw in Antigua. I will have to break these posts down in order to not overwhelm you with photos. I do love my pictures, though. Love the banner photo at the top and the whole post. Thanks! I always try to put a banner on top to make the post more fun! I had such fun that day with you Nicole! 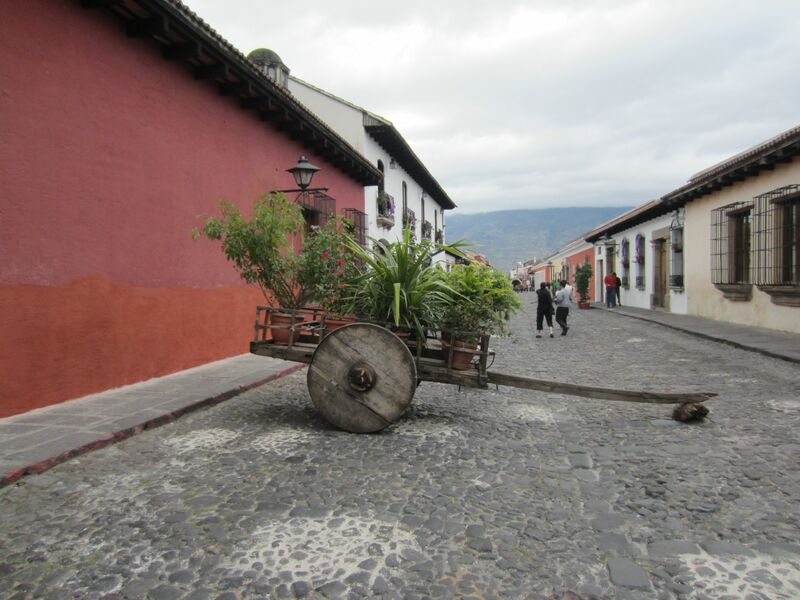 It was an honor to show you around Antigua and I’m looking forward to more posts of our day! By the way, the cart in the Calle del Arco is only there as decoration on the weekends when the street is closed to traffic. Seeing your photos brings the day back vividly!!! I know! Time flies by so quickly, it’s scary! Yes Antigua is one of the most beautiful cities I’ve ever been to, save Paris! I really loved it there. The more I look at the cheesecake the more I wish I could transport a piece to me now! Mmmmm. Beautiful Antigua! It warms my heart to remember it through your photos and stories. Did you make to the market? I did make it there but it was the end of the day and we were worn out! I did get to see the Chicken BUs station though! I went crazy snapping photos of that! Wish I had more time there. I really loved it. Now I’m hooked on Central America. I hope to go back soon. Maybe I can try another country for volunteering next year. What a fascinating place! 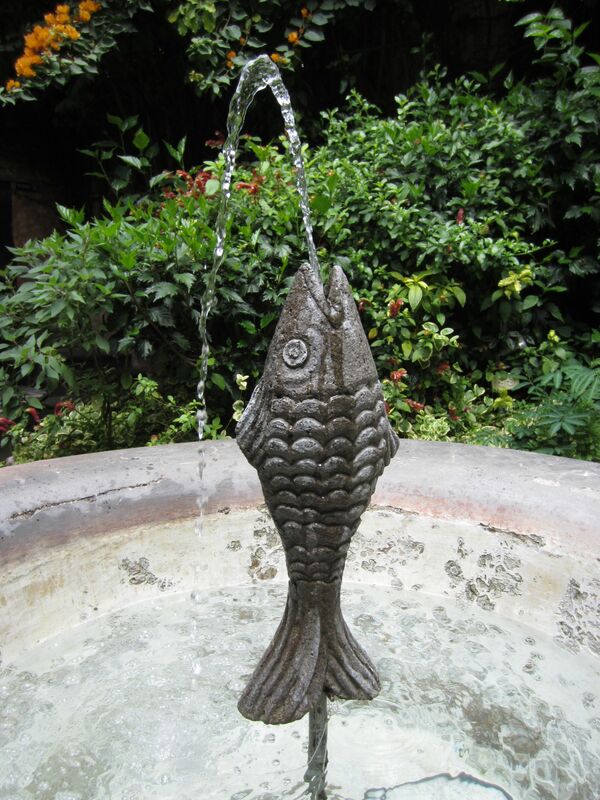 I love those fountains. 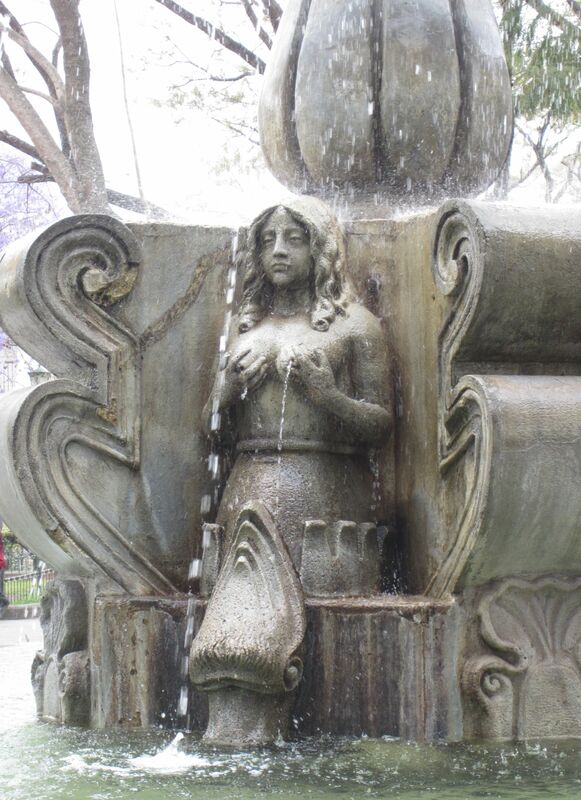 Bologna has a fountain with the spouting breasts as well. Thanks for the ping back! So appreciated! :) Now to check out the others!!! I love your pictures too 🙂 Thank you for another lovely post! I’d love to one day visit Latin America. I’m sure that the shared colonial past of the Philippines to these Latin American countries will make me feel quite at home (though I don’t speak Spanish). Your pictures are wonderful, capture the essence of the place.